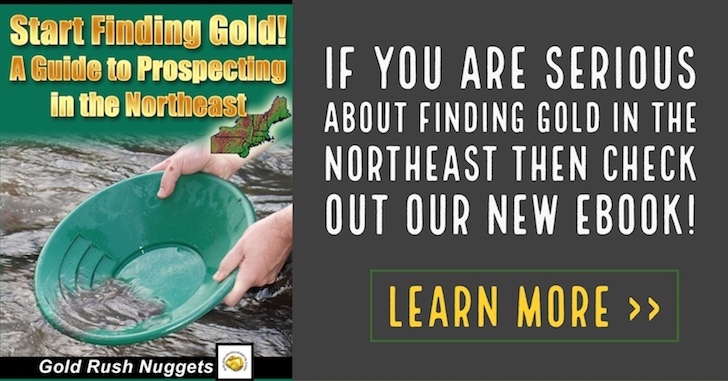 Where to find Gold Prospecting and Panning in Maine. Placer gold can be found throughout the state of Maine. Although some small lode deposits have been discovered, most of the gold will be found by panning and sluicing in the creeks and rivers. The western part of Maine is best known for gold mining, although small amounts of gold can be found throughout the state. Much of the placer deposits are very fine dust, and careful panning is required to contain to small gold. It is possible to find larger “picker” sized pieces of gold, as well as the occasional nugget for the hard working gold prospector. The following counties in Maine have each produced some gold: Aroostook, Cumberland, Franklin, Hancock, Kennebeck, Knox, Oxford, Penobscot, Somerset, Waldo, and Washington. Some specific areas that are well known for producing placer gold are listed below. Of course, there are certainly more areas that likely have gold bearing gravels, and further research will increase your chances of prospecting success. The Swift River and its tributaries in Oxford and Franklin counties – these is likely the best place in the state to pan for gold, and one of the few areas in Maine where sizable gold nuggets have been discovered. Sandy River in Franklin County – many of the tributaries that flow into the Sandy River are worth exploring with your gold pan. Fine gold deposits can be located all throughout Franklin County. Gold Brooks throughout Oxford, Franklin, and Somerset Counties – there are several old hardrock mines in these counties that produced silver and gold as a by-product, which may also have placer gold present in nearby streams. St. Croix River in Washington County – this is primarily very fine gold that is likely sources from the surrounding lead and zinc mines that produced gold as a by-product. Aroostook County is both the largest and the North most county in the state. Gold mining in this state is concentrated along the Aroostook River. Most of the mining activities are done near the Ashland. Cumberland County is also known for lode gold although placer gold has been reported to be found in a number of streams. The major gold mine in the county is the Piscataqua Mine, which produced both lode gold and copper. Oxford County is particularly noted for its gold occurrences. In addition to those noted above, other placers you can find gold is around Cutler Mountain, which is home to the Frenchman's Gold Mine, which produced feldspar and mica with quartz gold as a byproduct. Maine is much more “miner friendly” than some of its neighboring states, and actively welcomes and promotes gold mining as a recreational activity. 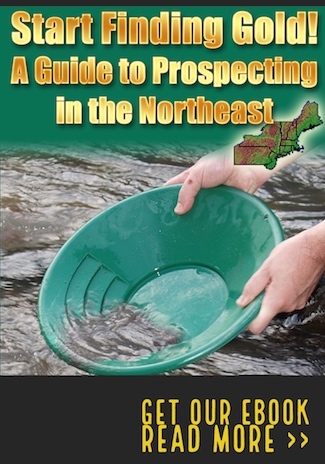 At the time of this writing, no special permits are required for gold panning in Maine. Sluice boxes under 10 square feet in size, and dredges with a hose diameter of 4” or less are also permitted in Maine. These regulations are specifically worded for streams that have sandy, gravelly, cobbley substrates, and permitting may be required in areas that damage to vegetation or streambank soils may occur. As with most prospecting, if you are uncertain about specific rules, it is best to contact the appropriate agency for clarification. In Maine, contact the Division of Land Resource Regulation, Bureau of Land and Water Quality.